The Croydon Healthwatcher Blog takes a current issue that has come up either through our research or in response to changes in services and discusses this with reference to wider sources. It’s a great way of getting to understand some of the challenges and how they might be responded to. One of the roles of Healthwatch is getting views from the seldom heard and hard-to-reach and the one group that sums this up is Croydon’s youth. You may not be aware that Croydon has the largest under 15 population of all London boroughs with 22% of the population. This means 84,000 people who rarely get to have their say on services. The reasons for this are not unusual. Firstly, most are in schools or family settings where it is difficult for us to access, compared with individual living independently. Secondly, since we tend to focus on conditions, and since most are lucky in good health, we don’t tend to come across them. Although mental health in children and young is now becoming a bigger priority, as it services for those with learning disabilities. Two weeks ago, my week was bookended by two great opportunities to meet under 15s. At the South West London NHS Health and Care Plan event, I got to facilitate a table of Tudor Academy pupils from New Addington, and then Healthwatch Croydon participated in Youth Takeover day where we showed seven youths what we did and encouraged them to undertake outreach with us asking residents their views on services. The young children aged 10-12 at the Health and Care Event, not only sung at the start of the event as part of their choir but stayed the whole morning to give their views on how health services could be changed or improved to meet their needs. There was literally a factory of ideas with tens of post-it notes on different ways that people could take control of their health and also get the services they need. There was a big emphasis on reducing isolation, learning about healthy eating and lifestyles and a focus on mental health and wellbeing. These articulate youngsters presented their views at the end of the session, and are a real credit to their school and their community. I was inspired by their positivity and problem-solving focus. Having a chat with the Deputy Head of the school, she explained the community focus the school had. They run mother and baby groups to help raise the profile of the school but at the same time help with social isolation, which shows the roles that other organisations beyond health centres can give. With so many schools in Croydon, could they not be funded to provide services? Especially as they connect with children and young families on a daily basis for 39 weeks of the year, not to mention after school and holiday clubs. Hats off the Clinical Commissioning Group for building a good relationship with the school as well. As a result, they are very open to engagement as a result and Healthwatch have been invited to visit the school and gain views from parents and children alike. On Youth Takeover day, we took seven 11-17 year olds, on two rounds of outreach at London Road Medical Centre, where they met social prescribing staff as well as patients. In the afternoon, we did a similar tour of the hospital main reception where we gained many comments on service, and where they also got to meet the new Interim Chief Executive of Croydon Health Services, Matthew Kershaw. Many of the teenagers found the process both interesting and challenging, having to do much active listening. For us it was a good opportunity to hear their views on services as well, which were a little less forthcoming. It seems that many do not use services that much, leading us to think about how health and social care services can engage with this part of the population. Interestingly, many few used other services such as youth clubs, but they did all attend school, so maybe that is the approach that commissioners and providers need to focus on if they want this group to engage. Other ways maybe through some council projects. Indeed, we had some useful conversations with the Youth team at Croydon Council, about working with the Young Congress and networks of young people to gain their views. With so many challenges both around physical but also mental health, it is important that their voice is heard. After all, they are the future generation for Croydon and engaging them now, will ensure they are active citizens in the future, contributing to discussions on building better services for all. On Wednesday 28th November, Healthwatch Croydon had the opportunity to visit Croydon University Hospital new Emergency Department. The new A&E is a complete overhaul from the previous department and includes a new state of the art technology as well as well thought logistical patient pathways, clearly, there has been a lot of thought put into the best way to improve efficiencies for Healthcare professionals and also the comfort of the patients who will be using the service. Having had a full tour, we think the new department is truly magnificent. This wonderful new building cost more than £21m to construct and has been designed by the hospital’s doctors and nurses to create the best environment in which to care for our community. This is a great new facility but we need to be sure we only use it when we need emergency care so that staff can focus on those who really require their expertise at this busy time of the year. That means that we all need to think about how to choose the right services for our health and care needs this winter and why I have pledged to become a Croydon NHS #WinterChampion. If you do need to visit the new Emergency Department at Croydon University Hospital, then you will notice a big difference from the old facilities. It is 30 percent bigger than the hospital’s previous Emergency Department and has rooms with doors for every patient, rather than curtained cubicles, for better privacy and dignity. There are two separate waiting areas for children and adolescents. There are also two mental health liaison rooms offering private and appropriate spaces where nurses can assess people who need specialist care, plus a dedicated Children and Adolescent Mental Health Service (CAHMS). In addition, the Emergency Department includes a new 24/7 Urgent Treatment Centre with six consultation rooms and a treatment room where people with more minor ailments can be looked after by qualified staff, all of which are well signposted from the clear and open entrance of the new department. The departments are set out so that patients are able to feel at ease throughout the experience, with navigational infographics on the walls of each consultation room, throughout all sub-departments in the building such as the Urgent Treatment Center and children services. The main A&E department waiting rooms are designed with atmospheric orange artwork to help improve the atmosphere of the department, and the Children’s A&E, has incorporated the use of soft natural lighting to improve comfort for these more vulnerable groups. Children’s A&E has incorporated into it an interactive playroom with a soft play area including some more age-appropriate games with the installation of a games console. It is not only patient experience with has been well thought out, each room has a wall mounted tablet which is linked up to the nurse’s station, pictures will be transmitted in real-time to ensure that the status of the patients is known centrally and more efficiently, making use of time more efficiently for healthcare professionals. So, if you feel unwell, don’t wait for it to get worse because expert health advice is available at your local pharmacist for minor ailments, or you can book an appointment with a GP during their extended hours of 8am-8pm, 7 days a week. You can also phone NHS 111 to speak to trained staff and clinicians about immediate health concerns. NHS111 is available 24 hours a day and is free to call from landlines and mobiles or you can visit www.nhs.uk or search #StayWellThisWinter on social media. I am so pleased that we have such wonderful facilities and a wide range of different emergency and urgent care services for our community as we head into this busy time of year. We all have a part to play in looking after our health and choosing the right service, so I hope everyone will help the NHS to help us this winter. Healthwatch Croydon is touring GP and health centres, community centres and groups in the Addiscombe Woodside and Shirley area from now to end of September 2018. Our first tour date on our Listening Tour will be on Thursday 9th August at Ashburton Library, click here to find out more about this event. Contact us at info@healthwatchcroydon.co.uk if you want to host an event or can recommend someone we can talk to about hosting. Your views can deliver better services. Would better communication solve this game of snakes and ladders? Last month, we were contacted by a Croydon Grandmother who told us her story of what happened when her grandchild had a suspected fracture. Being aware that the Purley GP Hub, would be the nearest and most relevant place to go, they went there. Previously, the Minor Injuries Unit was always nurse led and residents were told that this was the reason they could not access the x-ray facilities. Now the Hub was GP led, it followed that the xray facilities would now be accessible. They waited for an hour and half before seeing a GP who suspected it may be fractured and suggested she go to Croydon University Hospital’s Urgent Care Centre as they could x-ray it. When the grandmother suggested there were x-ray facilities at Purley she was told that they were not available for this type of injury. So finally she went to East Surrey Hospitals A&E department and got the care for her granddaughter there, which meant another three- mile journey and more delay in getting treated. Whatever people may feel about a service, nobody should have to wait over two hours in pain and have to see one specialist who then tells you to go somewhere else. Isn’t this the opposite of an integrated minor injuries service that is supposed to take the pressure of A&E? This story raises two big issues one about buying of services that an x- ray facility exists that cannot be used and the other about poor signposting and communication of existing services. We investigated further the pathway. Why is it that there are x-ray facilities at Purley GP Hub, but on this occasion they could not be used? Croydon Clinical Commissioning Group (CCG) told us that all GPs have the power to refer an x-ray at Purley but these are for injuries considered more serious, such as a chest injury. We were advised that patients with injuries considered less serious should go to go directly to Croydon University Hospital. In short, while an x-ray facility exists it is only used in certain situations and there is no requirement to x-ray for suspected fractures at Purley. To the public this is clearly a confusing proposition. The reason for this is that this was not an essential option in the recommissioning of urgent care services that concluded in 2016. While the issue was discussed in the reprocurement process, the decision was taken that in order to meet the ‘right place, first time’ requirements for treatment, x-rays for minor injuries would be performed at the Urgent Care Centre at Croydon University Hospital. The problem was that this has not been clearly or effectively communicated. Indeed Healthwatch Croydon only found this out after being sent a link by the CCG to a set of questions about the reprocurement process published deep within the CCG website. As our research into GPs which is being published this week shows this is indicative of a system that is confusing the public. Indeed our research at hubs showed that whilst the majority of people we spoke to are happy with the quality of service provided, a clear majority were also unclear as to what was provided and where. When hearing this grandmother’s account, we feel that she should at least have been informed at Purley Hospital on arrival that they did not deal with suspected fractures, and that it may be better for her and her granddaughter to go directly to Croydon University Hospital, rather than waiting for a GP assessment. A basic triage facility would have identified the potential injury and advised accordingly. It is an obvious assumption to make that a service with an x-ray unit, will conduct x-rays and if this isn’t always the case, then at a minimum the communication of this needs to be improved. This is even truer for Purley which used to have a minor injuries unit. Croydon is not unique in these circumstances. Only last month, NHS England published guidance on what non-hospital based centres should be offering from 2019 see Urgent Treatment Centres – Principles and Standards July 2017. On page 4 it talks about the public being confused by a mix of walk-in centres, minor injury units and urgent care centres, with a confusing variation in opening times and what diagnostics may be available. It is even refers to x-ray facilities but still refers to their use in some cases and later on page 8 at the recommendations makes only desirable plain x-ray facilities available, uses the number of people using the service as an deciding factor. Firstly, there needs to be better communication of the quickest, most effective pathway for people with different injuries and conditions to take when they arrive. This starts with effective triaging at GP hubs. By having trained professionals such as GP and nurses on the front desk, they can make swift assessments and decide whether you need to stay at the Hub or go somewhere else. Secondly, a review of the demand for x-ray services needs to be made. The reason to make this decision was based on research by the CCG back in 2015. Well perhaps demand has changed, or maybe they need to look at cases for using the facilities when dealing with more vulnerable groups such as children. Finally, much stronger and wider communications of which services are available where and how, which are easily accessible by phone call, mobile and print advertising, so that whatever age or background, a person genuinely gets to use to the ‘right place, first time’. It is time to end this ‘snakes and ladders’ approach to an essential service, we should all be able to get care at the right place as swiftly as possible. After all, isn’t this what the reprocurement of urgent care services was all about? Do Croydon’s BME carers get enough NHS support? The concerns and needs of carers is usually an area long overlooked by policy-makers and NHS providers. While the focus is on those being cared for, carers sometimes get missed out in the system, as some of our reports on hospital discharge in 2016 suggested. Did you know that according to Croydon Carers Information Centre, there are 33,000 carers in our borough? Yet it has one of the lowest carer Health Check take up rates of all London Boroughs with just over 1 in 20, 5.4% of the eligible population being offered a Health Check. The Croydon Carers Strategy 2011-2016, noted that while carers often neglect their own health and wellbeing, Black Minority Ethnic (BME) carers in particular faced additional difficulties of stereotyping and social inclusion. The 2011 report Half a Million Voices noted that BME carers provide more care proportionally that White British carers, which puts them at greater risk of ill health, loss of paid employment and social exclusion. These are, of course the same issues as White carers, the difference is that they also have to deal with cultural barriers, stereotyping, language difficulties, which further enhances the exclusion. Some BME groups also suffer more exclusion that others with Bangladeshi and Pakistani carers particularly challenged. At the local level, the London Borough of Croydon’s Carer Engagement 2017 report, which surveyed carers in the borough, had responses from 59% white carers and 24% BME, yet the population in Croydon is 54% BME, 46% white. The report proposed that future engagements should therefore seek responses from BME community to ensure better representation. IRISS Insights, who specialise in enhancing the capacity and capability of the social services workforce, suggested in their report, Improving Support for BME Carers that there is little guidance concerning the needs of BME carers. Part of the issue is the difficulty in obtaining accurate information about the size and nature of the BME carer population. Census questions identifying BME carers have existed since 2001. This has made a difference, but underreporting is high, due to language barriers, concerns on immigration status, or a perceived suspicion of sharing data with the State. Carers UK research suggest BME carers are more likely to struggle more financially, be more likely to be caring for a sick or disabled child aged 20-24 (which reflects long-term caring responsibilities) and be more likely to be caring for someone with a mental illness. As a result, carers have had restricted access to education, employment and, when in work, promotion. Ethnicity data has improved significantly since the 2010 Ethnicity Act made a legal requirement for health and social care providers to collect data. This UK-wide data has revealed that Indian, Pakistani and Bangladeshi groups report a poorer experience than White British people. But it is not clear where in the system they are experiencing unfair or inequitable treatment. Where research has taken place, the key issues were language barriers and knowledge of services and cultural challenges. For example, in Bengali, Gujarati, Urdu and Punjabi there is no word that translates to ‘carer’, so the role may not be recognised or perceived as a role that needs support. There are also concerns that NHS services could not meet cultural and religious needs, so services were not taken up. While Healthwatch Croydon is here to represent the views and experiences of all Croydon residents, we do also have a duty, in law, to gain the views of those least represented. BME carers clearly fall into this category, particularly where we have a population that is 54% BME. This area of work is clearly under-researched and has many contradictions. Therefore, the focus of the first of our in-depth research reports in 2017-18 will focus on asking BME carers about their experience of using Croydon’s GP services, to see if their needs are being met. It is important that anyone irrespective of background gets the neccessary support they need. In a borough with such a rich diversity of people, services need to be able to respond to all service users wherever they come from. The aim of this report, will show any barriers to access and therefore guide NHS buyers in delivering services that give BME carers the support they need, but we cannot do it without the views of BME carers. 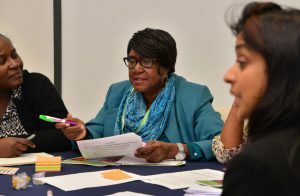 If you are a BME carer, come and share your experience at by filling in our survey by 21 July or contact our Community Engagement Manager, Geraldine Bolam on 020 8663 5632 or geraldinebolam@healthwatchcroydon.co.uk for a one-to-one chat. We can only influence change with your experiences. Recent decisions by Croydon CCG, to close Foxley Lane women’s mental health unit and to cease assisted conception (IVF) services despite public engagement resulting in substantial opposition to these cuts, raise two important questions for me. Firstly, what power should patient have to influence decisions on healthcare and secondly what is effective engagement and how does it differ from consultation? The NHS Constitution states that a citizen we have the right to be involved, directly or through representatives, in the planning of healthcare services, the development and consideration of proposals for changes in the way those services are provided, and in decisions to be made affecting the operation of those services. Section 242 of the consolidated NHS Act 2006 and 2012 Health & Social Care Act places a duty on NHS trusts, CCGs & strategic health authorities to make arrangements to involve patients and the public in service planning and operation, and in the development of proposals for changes. While the legislation defines that patients and public need to be engaged it does not define effective models of how this should be delivered. So, what is a good example of engagement? 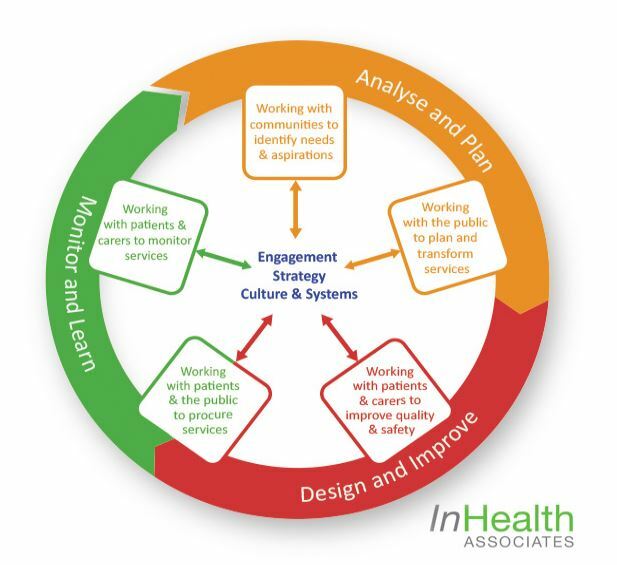 David Gilbert of InHealth Associates, a specialist consultancy that helps NHS organisations deliver better patient and public engagement suggests proposes an engagement cycle. At each stage, patients and the public have a role to play in services. What is interesting about this cycle is that is looks at getting public, patients and communities involved right at the beginning. Working with patients and carers to monitor services and share learning. This engagement cycle isn’t very new, it has been adapted and tested by dozens of CCGs and NHS organisations across the country. Utilising this model is more likely to result in the public feeling valued, trusted and in a position of influence, the commissioner understanding that they have reliable data, and the backing of the public in their decision-making. And with the right commitment, it could happen here in Croydon. Which takes us back to the Foxley Lane and assisted conception decisions. Had the CCG sought public engagement right at the beginning of the process, instead of consultation towards the end, the public may have gained a greater understanding of the complexities and this might have helped the CCG in terms of trust. The same decision may have been made, but at least the public would have been engaged in the process and had some ownership of it. That is not to say that this kind of public involvement does not happen in Croydon. A Healthwatch Croydon volunteer was recently part of the procurement panel for the new urgent care services contract. The insights he gained as well as the input he gave shows what can be possible. What’s more he feels, that he contributed to this shared decision. An example of the CGG doing with its service users not too its service users. Another positive example of this, is the commitment given by Croydon Council’s public health team to work with HWC in involving teenagers in the service design of sexual health services in the borough. based on the recommendations of our research report. We need to see more of this kind of public engagement but earlier in the decision-making, and it is not just the CCG, but at the two NHS Trusts and with the Council. Public engagement is not rocket science. This discussion is even more important when you consider that there are due to be major changes to health and social care in Croydon as a result of the South West London Sustainability and Transformation Plan. Now more than ever is the time to consider real engagement, particularly when the changes to services are substantial and predicated on hard financial decisions to be made. So, when are the commissioners are going to take up the challenge of the engagement cycle and engage with the public as true partners? The benefits could be transformational for all concerned. Youth Takeover | Student Nathan Bigord "What I learnt"
Working with the Croydon Healthwatch Team provided me with invaluable skills and knowledge. Most notably, one of the skills I had developed from this experience was the ability to approach citizens and ensuring the “15 seconds” of their attention was enough for them to proceed with asking for their opinion on Croydon’s health service. Another skill I had developed from this experience was listening and expressing people’s ideas, as well as taking notes to ensure their view was fully represented. The awareness of how government funding is divided up for the different health services was interesting to find out because it provided a better explanation for the reason some services perform better than others. 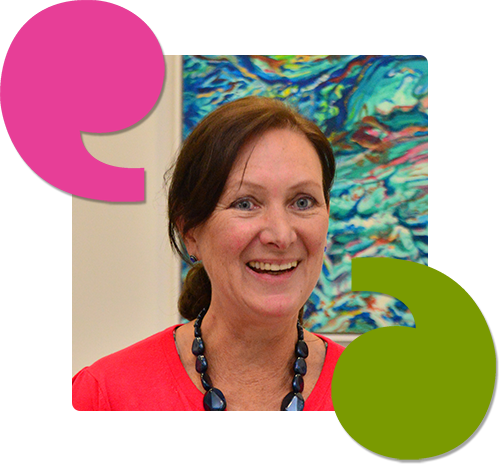 The beautiful thing about Healthwatch is that it accepts our medical services are not perfect, and they wish to improve things by using the voices of the people as navigation to better medical services in Croydon. Although, it was quite upsetting to hear some of the stories told by the people I was speaking to, and I could tell they were extremely hurt from their experience with health services – I hope that by spreading awareness of Croydon Healthwatch more people can know their feedback is valued and that services such as Healthwatch need to know these things so that more can be done to protect these people. It was truly an honour to work with the Croydon Healthwatch team, they were very kind and a joy to work with, they treated me as though I was a part of the team and valued the contributions I had given throughout the day.